David Williams was Labour's Parliamentary Candidate for Crewe and Nantwich at the 2010 General Election. "Today is a very special day and I hope everyone enjoys themselves. It is particularly special for children and a chance for families to take a well earned breather from the daily grind. "My thoughts are with those who have to work on Christmas Day and, particularly our emergency service workers and our armed forces, my thanks go out to them. "There are of course people across the world who are living in much poorer circumstances than us. It is important that we remember them and direct some of our seasonal generosity towards tackling worldwide poverty. Political solutions are also crucial and it is incumbent upon all politicians to work towards a lasting worldwide settlement on conflict, famine, poverty and other humanitarian issues. "Please accept my sincere best wishes and season’s greetings." David Williams, Labour’s Parliamentary Candidate for Crewe and Nantwich, was invited to address the Nantwich branch of The Royal British Legion at the Conservative Club on Churchyardside, and has signed up to their ‘Do Your Bit’ campaign. The Royal British Legion have drawn up a manifesto for the next General Election and to ensure that the next Government does their bit for the whole Armed Forces family. David Williams told the Nantwich branch that the Government has already announced a review of the Armed Forces Compensation scheme, with Admiral the Lord Boyce acting as an independent chair of the review. Ensuring that our Armed Forces have better accommodation has also been a priority of this Government in remedying decades of under investment. The Government has committed £3bn to enhancing accommodation over the next ten years. The 2009 pay award of 2.8% meant that for the third year running the Forces pay increase was amongst the highest in the public sector. Welfare support for casualties in hospitals has been much improved. 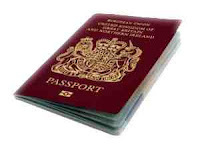 • Service dependents can retain their place on an NHS waiting list when they move to a new area. • Injured personnel can now access grants of up to £30,000 to adapt their home, without their compensation payments being means-tested. Seriously injured personnel are entitled to privileged access to affordable housing schemes in England. • Priority status in affordable housing schemes across Great Britain, including the ability to apply 12 months after discharge. David concluded, “The Nantwich branch of the Royal British Legion made me very welcome and we had a very useful and fruitful discussion. The branch raised a few issues that I will take back and discuss with the appropriate Government Minister. David Williams, Labour’s Parliamentary Candidate for Crewe and Nantwich, strongly condemned the increase in the number of incidents of people throwing stones at railway trains. A recent report by the BT Police shows that the number of such incidents has increased over the past few weeks, and that children as young as ten have been seen throwing stones and other objects at trains in the Crewe area. David Williams, Labour’s Parliamentary Candidate for Crewe and Nantwich, has congratulated Hon Alderman Peter Kent on receiving the prestigious Award of Merit from the Labour Party. Hon Alderman Peter Kent was presented with the Labour Party’s prestigious ‘Award of Merit’ by David Williams and Stephen Twigg last week. The award recognises a lifetime’s dedication to the Labour Party. David Williams, Labour’s Parliamentary Candidate for Crewe and Nantwich, has welcomed the reduction in Bingo Tax recently announced in the Pre-Budget Report, but wants it to go further. David Williams said, "I very much welcome the move to reduce Bingo Tax from 22% to 20%. It shows that the Chancellor is listening and is prepared to act even when we are in the middle of a recession. However, I will continue to campaign for a further reduction to bring the tax in line with other forms of gambling." At present the rate of tax applied to sport betting, betting exchanges, casino games, internet gambling and football pools is levied at 15 per cent. That also includes internet bingo. 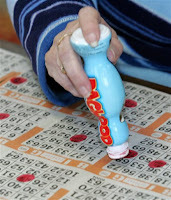 David Williams went on to comment, "I do not understand why there is a separate bingo tax in the first place. It seems bizarre that online bingo has a lower tax levy than playing the same game in real life. I understand why that's infuriating for the bingo industry. Thousands of people in Crewe and Nantwich enjoy a night out at the bingo. I don't see why bingo hall owners are penalised in this way." ‘DAVID WILLIAMS HITS OUT AS THE TRUE COST OF TORY TAX CREDIT PLANS WOULD HIT MILLIONS OF MODEST INCOME FAMILIES’. David Williams, the Labour Party’s Parliamentary Candidate for Crewe and Nantwich, has issued a stark warning as the true cost of the Tory Tax Credit plans is revealed. At the Tory Conference earlier this year, George Osborne outlined the Tories’ plan to get rid of the Child Tex Credit for households on more than £50,000 per year in total. They said that this would raise them £400million. It emerged at the end of last week however that George Osborne has got his sums wrong and there is a real threat that a couple on as little as £16,000 each, less than the average earning, would be hit by the Tory proposals. The Bombay Restaurant in High Street Crewe was packed to the rafters last Thursday when Crewe and Nantwich Labour Party held a ‘Curry Night’ and listened to Stephen Twigg speak in support of David Williams, the Labour Party’s Parliamentary Candidate for Crewe and Nantwich. David Williams today backed World AIDS Day to raise awareness of the plight of the more than 33 million people around the world living with HIV. Every day, over 6,000 people become infected with HIV and over 5,000 people die from AIDS. An estimated 1.9 million people were newly infected with HIV in sub-Saharan Africa last year, bringing to 22.4 million the number of people living with HIV. Around 14 million children have been orphaned due to AIDS. • £6bn up to 2015 targeted at strengthening sustainable health systems. • £1bn for the Global Fund to fight AIDS, Tubercolosis and Malaria to 2015. • A 50% increase in funding for research and development of AIDS vaccines and microbicides. • £90 million to UNITAID to increase access to paediatric care. • Targeting women for access to anti-retrovirals to reduce mother-to-child transmission. • more than 4 million people can now access anti-retrovirals, compared to just 100,000people who received treatment back in 2001. • The percentage of the world’s population living with HIV has levelled off. • Since 2004, 20 times more people have access to life-saving treatment. Since 2003 the price of first line AIDS drugs has halved. With only a few days to go until the climate change summit in Copenhagen, thousands of people are playing their part in getting a deal. Eddie Izzard is offering you the chance to win two tickets to his Wembley gig on Saturday if you sign up to my Ed's Pledge climate change campaign by Wednesday. Thousands of people will also be attending the Wave march in London on Saturday. The Co-op are arranging buses and Labour Students have been making banners. The more people who attend, the stronger our voice will be. I hope to see you there. In the days before the Copenhagen summit, it’s essential that every Labour voice stands up and says that we must get a deal. 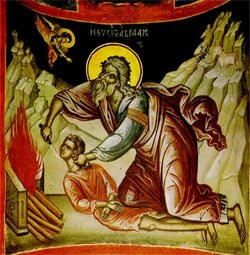 I send my best wishes to all Muslims in Crewe and Nantwich for the occasion of Eid ul Adha, which remembers the sacrifice of Abraham. Marking the end of the Hajj, this most holy occasion commemorates our common humanity and reminds us of the importance of devotion, fairness and the equality of all human beings before God. It allows those of us of other faiths, and none, to reflect on the unique Islamic contribution to Britain and to share with you in celebration of all that has been achieved by Muslims across so many walks of life. Today Muslims around the UK and the world will be reflecting on many challenges that face us and the deep moral issues like conflict, poverty and climate change. Together we can stand up to these challenges and move forward to a better world. Eid Mubarak to you all. David Williams, the Labour Party’s Parliamentary Candidate for Crewe and Nantwich, has reacted angrily to further delays by Cheshire East Council that could put the planned government investment in upgrading Crewe Railway Station at risk. The Briefing Note from Councillor Macrae suggests that Cheshire East has abandoned the already agreed Crewe Gateway Scheme and states that “it is premature to act immediately on the DfT announcement” which promised investment to upgrade Crewe Railway Station. David Williams, Labour's Parliamentary Candidate for Crewe and Nantwich, has welcomed today's Government announcement of an ambitious strategy aimed at ending violence against women and girls. As well as measures to further protect victims and tackle perpetrators, the Violence Against Women and Girls strategy signals a new focus on preventing violence from happening. From 2011, preventing violence in relationships will be included in personal, social, health and economic (PSHE) education so attitudes that condone and perpetuate violence against women are addressed before they become entrenched in young people. An awareness-raising marketing campaign to change behaviour will start in the New Year with a high profile drive to tackle violence in teenagers’ relationships. David Williams said, "Violence against women and girls is an obscenity, ruins lives, breaks up families and has a lasting impact across the generations. "Much has been done over recent years to increase protection for women and to punish their attackers with new legislation, extra resources and front-line training. Now we need to increase our focus on prevention. "This complex problem demands a broader response to stop violence from happening in the first place. Changing attitudes that tolerate violence against women and girls will take time, but is essential if we are ever to break the vicious cycle." Prevention: Aims to address social attitudes and myths about violence, which perpetuate it. Our long-term ambition is to change behaviours and stop violence happening in the first place. 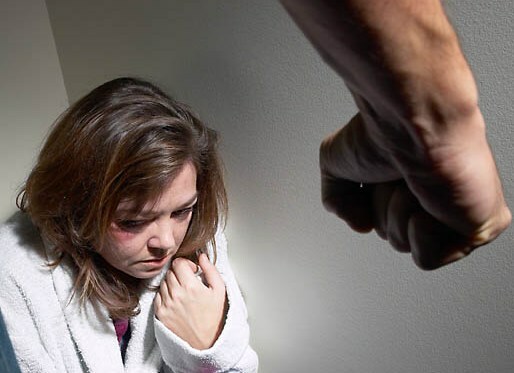 Provision: Where violence does occur, the Government is committed to offering victims the help they need such as counselling and access to specialist services. Protection: Measures to help women in contact with the criminal justice system to improve their experience and steps to better manage offenders. Sandra Horley OBE, Chief Executive of Refuge, said, “Refuge is pleased that the Government’s new strategy focuses on preventing violence against women and girls. This huge social issue will only end when people are educated about why it happens and where they can get help. David Williams has called for an end to spin and lies in the run up to the general election. David Williams said, "There are clear differences of policy between Labour and the Tories and people in Crewe and Nantwich will have a real choice. Voters are not best served with misleading press statements, they are clearly saying to me that they want to see an open, honest and respectful debate between the candidates. I believe that's the least they deserve." David Williams was commenting after seeing misleading Tory accusations about the funding of Labour's new National Care Service. David Williams continued, "We are offering free personal care for those with the highest need, in their own homes. It is completely wrong to claim that funding for any aspect of Labour's care reform proposals in the Queen’s Speech comes from cutting people's benefits. All the proposals are funded through efficiencies and reprioritisations in the Department of Health and in Local Government. David Williams concluded, "That is a clear and categorical assurance from the Minister, which I very much welcome. I hope that lays to rest the false accusations. Perhaps the Tories would do better to tell us about their care plans instead of misrepresenting Labour's." David Williams, Labour's Parliamentary candidate for Crewe and Nantwich, is urging local people to go online and back a new campaign to turn a promise to tackle global poverty into a law. The www.globalpovertypromise.com website is part of a campaign to put the Government’s promise to raise international development aid to 0.7% of national income by 2013 into legislation. 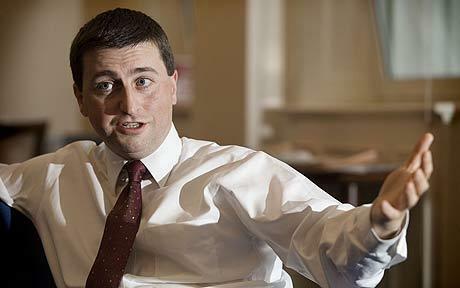 Douglas Alexander, Labour’s International Development Secretary, said, “Aid increases and debt cancellation have helped to get 40 million more children into school, while the number of people with access to AIDS treatment has increased from just 100,000 to over 4 million. The proportion of the world’s population living in poverty has fallen from a third to a quarter thanks to a combination of both aid and trade. - Last year alone, Labour’s Department for International Development helped train over 100,000 teachers, vaccinate more than three million children against measles, provide a million people with clean water, protect seven million people with anti-malaria bednets and give more than 12 million people access to better sanitation. David Williams, Labour's Parliamentary Candidate for Crewe and Nantwich has welcomed the personal commitment of Lord Adonis to the establishment of a rail academy. Speaking to the Campaign for Better Transport the Secretary of State for Transport said, "Equipping our workforce with the skills to support new rail construction and maintenance is vital. "So today I can announce my backing for a bid to launch a National Skills Academy for Railway Engineering, to address skills shortages in the rail sector and to develop UK railway industry expertise. "The Academy would train railway staff at all levels, and equip apprentices with a broad range of design, construction and maintenance skills to support key projects like Crossrail, and our rail electrification programme. It will complement the Crossrail Tunnelling Academy, which will be set up next year to train 1000 people in tunnelling skills. "It’s all about preparing Britain’s rail industry for the future, and not just delivering a better, more efficient railway at home, but also selling our products and expertise abroad. "The Academy, if approved, could very likely have its first centres in Crewe and London." David Williams said, "I am absolutely delighted that the Secretary of State has given his personal commitment to the rail academy. This is something that the rail and engineering trade unions have long campaigned for. Such an endorsement from a Cabinet Minister takes us a whole lot closer to delivering this much needed investment in skills training. I really believe it will now happen. "This investment is only available because Labour has been prepared to put money into jobs and training to help Britain out of the recession. Investment that wouldn't be available under from the Tories who have persistently and criticised Labour for our fiscal stimulus. A fiscal stimulus that has lead to more apprenticeships, training and job opportunities for young people in Crewe and Nantwich. It's time the Tories were honest." I was due to meet management and union representatives from Bombardier at Crewe Works today at 1pm along with North West Euro MP Brian Simpson. Overnight developments have now lead me to withdraw from the meeting. I was informed late yesterday that my presence at the meeting had lead to angry complaints to the Company from Edward Timpson MP. I believe this intervention placed the management and unions in a very awkward position and I have decided to withdraw from the meeting so that Company and Unite the Union representatives have the opportunity of meeting Brian Simpson MEP. 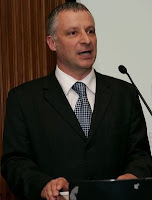 Brian is an important ally given his position as the local MEP and Chair of the European Transport Committee. I was surprised by the intervention of the MP. 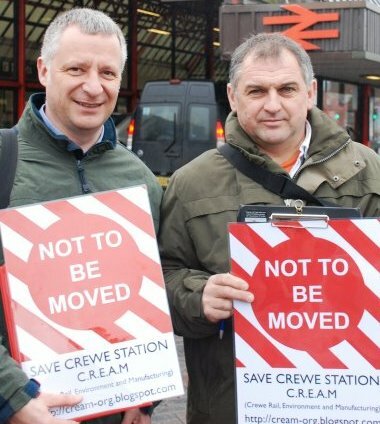 I think it is a huge mistake to attempt to make the future of Crewe Works a 'political football'. The employees on that site need all the help they can get and I would have hoped that all parties could have worked together for the future prosperity of one of the Town's largest employers. This is an occasion when I would have thought that it was far more important to find a speedy resolution to Bombardier's problems rather than obstructing genuine moves to seek the help they so desperately need. Bombardier and their employees continue to have my 100% backing. I will carry on lobbying Ministers for support for the company and particularly Crewe Works. I want to make sure that Labour's record investment in the railways brings jobs and work to Crewe and Nantwich and I would have hoped that the town's MP would have shared my concern and lent his assistance in this. Conservative campaigns on the NHS have been wrong every year. Once again they are propagating a dirty, pernicious, misleading campaign, designed to confuse some of the most vulnerable people. In 2006 they claimed 20,000 jobs were being lost in hospitals - but within days Andrew Lansley was forced to concede this was not true and, when pushed, could only identify two jobs that were being cut - both administrative posts. In 2007 they claimed 29 hospitals were at risk - but the hospitals they had identified not only refuted their claims but criticised the Tories for scare-mongering. In 2008 they claimed 1,700 GP surgeries would be closed - but their Health spokesman admitted in Parliament that concerns over GP practice closures were unjustified. Today once again the Tories are scare-mongering on health. It is completely wrong to claim that we are funding any aspect of our care reform proposals by cutting people's benefits. All the proposals we outlined in the Queen's speech are funded through efficiencies and reprioritisations in the Department of Health and in Local Government. Labour has categorically ruled out using Disability Living Allowance for under-65s and been absolutely clear that those currently receiving Attendance Allowance and those over-65receiving DLA would continue to receive an equivalent level of support and protection in any reformed system. David Williams has welcomed the Government’s commitment to legislate for a fairer deal for agency workers. The announcement in today's Queen's Speech, that the Government will deliver for agency workers the right to the same terms and conditions of employment as permanently employed workers. David Williams said, "I have long campaigned for this measure and I'm delighted that the Government has listened. This will not only benefit the agency workers themselves, but it will stop rogue employers from undercutting permanently employed workers by exploiting agency workers. "Many people in Crewe and Nantwich have said to me that they are unhappy that wages, terms and conditions are being driven down by the use of agency workers. That is clearly unfair and the Government is addressing that unfairness. "I am not opposed to the use of agency workers. Used correctly there are real advantages for employers and employees. Indeed my wife chooses to be an agency worker as a supply teacher. But it is wrong that they can suffer lower pay and employment rights." Agency workers will be entitled to the same pay, holidays, overtime, breaks, rest periods, night work and duration of working time as permanent workers after 12 weeks. David Williams, Labour’s Parliamentary Candidate for Crewe and Nantwich, has welcomed the announcement by Transport Secretary Lord Andrew Adonis today of the launch of a £50m fund for improvements in ten key railway stations in England following the report of the ‘Stations Champions’ on the state of facilities for passengers across the country. The announcement comes in support of the call by the ‘Champions’ for a comprehensive list of minimum standards for all stations aimed at improving the daily travelling experience of passengers and attracting more passengers on to the railway. More than £3bn is already being spent on stations over the next five years but ten major railway stations have been identified as being in need of major improvement. Crewe is identified as being one of these ten. 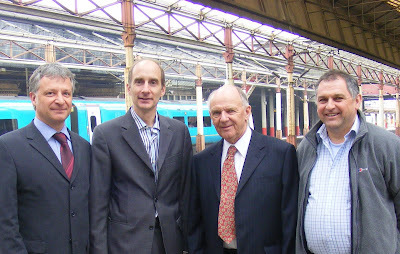 Transport Secretary Lord Andrew Adonis, together with ‘Stations Champions’ Chris Green and Professor Sir Peter Hall, is today embarking on a whistle-stop tour of the ten stations that will benefit from new £50m fund, supplemented by commercial and third-party contributions by Train Operating Companies. Former leading Cheshire Country Councillor David Newton added, “I do not understand why Cheshire East is delaying on this. I, and the late County Councillor Alan Richardson, worked on a Panel to put together the ‘Crewe Gateway Scheme’. The plan is in place and it should have been sent to the Rail minister as soon as he asked for it. What’s the delay? Where has the money for the scheme gone? Pictured: David Williams, Cllr Chris Thorley and Cllr Roy Cartlidge lobbying Lord Adonis for investment in Crewe Station. DAVID WILLIAMS WELCOMES THE TAKING BACK OF THE EAST COAST MAIN LINE INTO PUBLIC OWNERSHIP. 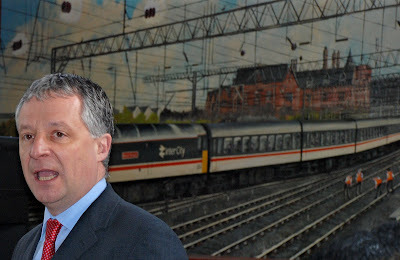 David Williams, the Labour Party’s Parliamentary Candidate for Crewe and Nantwich, has welcomed the announcement that the East Coast Main Line will be taken back into public ownership from midnight tonight. National Express has lost the East Coast Main line railway franchise which operates train services between London and Edinburgh. National Express was committed to pay £1.3bn under the original franchise terms, but attempted to ease those terms in talks with the Department for Transport broke down earlier this year. The staff currently employed by National Express East Coast will transfer to the new operator, and services are likely to remain in public hands until at least 2011. Directly Operated Railways has been set up by the Department for Transport and will be headed by the transport expert Elaine Holt. As Chief Executive she will lead a team of railway industry experts with expertise in engineering, administration and human resources. This week David Cameron announced that John and Edward are his favourites to win X-Factor. It’s hardly surprising. David Cameron and George Osborne are the Jedward of politics. Hilarious to watch. All spin and no substance. But you won’t be laughing if they win. In the current climate people need to know that the rules for immigration are fair. That’s why Labour has brought in new rules for employers. They must prove they cannot fill a post with a resident worker before they bring someone from outside Europe. Labour's Australian style Points Based System is reducing the overall numbers of migrants and making sure we attract only those people with the skills our economy needs. Migrants must also support themselves, learn English, pay taxes and obey the law. Their progress towards citizenship will be slowed if they don’t play by these rules. be to get people back into work as the economy recovers. People living here already shouldn't lose out to migrants, as that would be unfair. So this week we announced that when the Migration Advisory Committee advises us of skills shortages our priority will be to train people already living in this country, and take some occupations off the list of jobs open to migrants. The NHS is one of Labour's greatest achievements for Britain. A service that is available to all based on need - not ability to pay. From being on its knees in the mid 90s the NHS is now in better shape with more staff on the ground and new hospitals. But although there has been investment and improvement I think you want know what we have planned for the future. The answer is that Labour is going to give more power to patients. In the New Year Labour will introduce three legally enforceable rights. So by law if our local NHS Trust cannot meet the following three guarantees they will have to find you somewhere which can treat you as soon as possible. Even if it is in the private sector. • Seeing a cancer specialist within 2 weeks if your GP suspects you may have cancer. • A free health check every five years for those aged 40-74. • All treatment, for any illness, should be within 18 weeks of GP referral. And we want to go even further than these guarantees. Our cancer pledge is to give people the legal right to get tested for cancer and get results within one week of seeing your GP. Labour also wants to bring in the right to see a GP at weekends or in the evening, and to abolish practice boundaries for good. I will be campaigning for these new rights to be brought in as soon as possible. The Conservatives like to call NHS targets and guarantees "bureaucracy" and "red tape". They say they will get rid of all of Labour’s guarantees for patients. Including the guarantee that you will see a specialist within two weeks if you have suspected cancer. And they refuse to match Labour’s new one-week cancer diagnosis pledge. All the Tories offer on health is a gamble. David Williams, the Labour Party’s Parliamentary Candidate for Crewe and Nantwich, stresses the importance of remembering those who gave their lives in the fight to keep our country free in conflicts past and present. Former Borough Councillor Tom Dunlop from Shavington supports David Williams as the next MP of Crewe and Nantwich. Today – as we do each year - we remember the sacrifices made by generations of our armed forces who have given their lives in the service of this country. We celebrate their courage; we honour their extraordinary dedication and we remember them with pride. For the sacrifice – and the great achievements - of our armed forces are defining features of our nation - a testament to the strength and irrepressible spirit of a Britain always prepared to do what is necessary to protect the liberty and security of its people; a Britain that fights for its values; that stands up against the things we know are wrong. This is not just an essential part of British history – it is at the heart of modern Britain – and epitomised today by the immense service and sacrifice of our armed forces engaged in operations across the world, especially in Afghanistan. 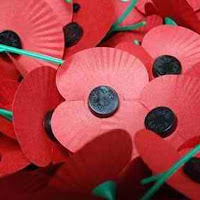 So, today we rightly remember and honour many generations of British service men and women - we also pay tribute to all those who have been killed or wounded serving in Afghanistan. As a nation we share the sorrow and grief that comes from the loss of their lives. 93 have been killed this year. That 93 is not just a number; but 93 families whose lives will never be the same again. 93 families without a Dad, or a husband, a brother or son. 93 families this Christmas with a place at their table no-one else will ever be able to fill. And as well as those who have died, more than 100 have been seriously wounded this year - in ways that will change their lives, and the lives of their families, for ever. These men are our heroes. We pay tribute to their memory today and every Remembrance Sunday. 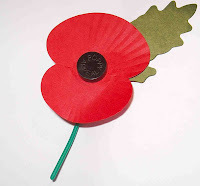 And though we owe them a debt of gratitude we can never repay; we will remember them. Just as in the past we learnt of the bravery and sacrifice of British soldiers in the First and Second World Wars; in their fight to protect freedom both in our nation and the world; so our children will learn of the heroism of today's men and women fighting in Afghanistan - protecting our nation and the rest of the world from threat of global terrorism. David Williams, the Labour Party’s Parliamentary Candidate for Crewe and Nantwich, urges the elderly to keep warm as winter approaches. Roy Cartlidge who represents Crewe West on Cheshire East Council supports David Williams as the next MP for Crewe and Nantwich. David Williams : Standing up for Crewe and Nantwich. David Williams, Labour’s Parliamentary Candidate for Crewe and Nantwich, has expressed shock and concern at the recent announcement that there may be further redundancies at Crewe’s Bombardier works. This latest announcement will take the total workforce at Bombardier from over 700 in May 2008 to under 300. At one time Crewe Works was the largest employer in the area, with many thousands of people being employed there. David Williams, the Labour’s Parliamentary Candidate for Crewe and Nantwich, is delighted to add his voice in support of the campaign when he was asked by a local member of the Royal Society for the Protection of Birds (RSPB) to sign their ‘Letter to the Future’. The ‘Letter to the Future’ asks the Government to invest in a healthy economy and a healthy environment – to protect jobs, to tackle climate change and to protect our seas, countryside and wildlife. Picture: David Williams together with Sarah Cartlidge, local RSPB member, and Councillor Roy Cartlidge who champions environmental issues, signing the ‘Letters to the Future’. Labour's Parliamentary Candidate for Crewe and Nantwich, David Williams, has condemned the decision by ‘First Bus’ to close their depot as short-sighted. David is a former bus driver for PMT, the predecessor of First Bus in Crewe. He said, "I am appalled at the action of First Bus to pull out of Crewe. The company appears to be seeking to save on garaging costs by making employees pay additional travelling costs. This would be a disgraceful imposition on the drivers who may well be threatened with redundancy if they do not accept the move to Newcastle, as has happened before. First Bus has said that they were unable to guarantee that there will be no redundancies as a result of their switch from Crewe to Newcastle. Workers will now have to commute from Crewe to Newcastle which will cost them in both time and money. He added, “I am calling on Cheshire East Council to review any assistance or subsidy that First Bus receives in the light of them abandoning Crewe. There are forty Drivers, Supervisors and Engineers who will be affected by the decision to close the Crewe Depot on 19th December and some who have already made the switch from Crewe to Newcastle have said the travelling has hit them hard in their pockets. Adrian Knapper supports David Williams as the next MP for Crewe and Nantwich. Labour's Parliamentary Candidate for Crewe and Nantwich, David Williams, joined with Usdaw colleagues in Crewe town centre to support the Union's Freedom From Fear campaign. David Williams, Labour’s Parliamentary Candidate for Crewe and Nantwich, met and talked with shoppers in Crewe town centre yesterday, 2nd November 2009. Usdaw (the Union of Shop, Distributive and Allied Workers) have highlighted the fact that one in every ten shop workers has been physically assaulted whilst at work. The survey also reveals that every minute of every day another six shop workers are verbally abused and a further one is threatened. As part of a nation-wide campaign, members of USDAW set up their stall in Crewe town centre yesterday to ask shoppers to pledge to ‘keep their cool at Christmas’. David Williams has pledged his support for the campaign and joined with the USDAW members to meet and speak with local shoppers in the run-up to the hectic Christmas Shopping period. He added, “Another flash point for abuse is when customers buying age-restricted items are asked to prove their age. I know of shopworkers who have been hit, sworn at and threatened for refusing to serve alcohol to an under-age customer. The campaign also calls for more police and PCSOs patrolling the street and more use of monitored CCTV to protect both customers and staff. Steven Roberts, a former Mayor of Crewe & Nantwich is supporting David Williams as the next MP as he speaks up and stands up for Crewe & Nantwich. David Williams, Labour’s Parliamentary Candidate for Crewe and Nantwich, met and talked with shoppers in Nantwich town centre last Saturday. Crewe and Nantwich Labour Party held a street stall in Nantwich town centre last Saturday, 31st October, as part of their initiative to meet and talk with the residents of the Crewe and Nantwich area. He added, “People are clearly worried about the global economic downturn and want to know whether Gordon Brown’s action to bring about a recovery will work, before they decide who to vote for. David Williams, the Labour Party’s Parliamentary Candidate for Crewe and Nantwich, has stressed the need for firework safety in the run-up to 5th November, and supports a crack-down on ‘Firework Yobs’. Fireworks yobs can be hit in the pocket. On the spot fines of £80 for disorder can be issued against anyone causing a nuisance with fireworks at this time of the year. Fireworks must not be sold to anyone who is under 18 by law. The Labour Government has also introduced powers for the police to fine those who cause a disturbance late at night, let off fireworks in the street or carry fireworks in public. The law is clear on anti-social behaviour: It’s simply against the law to possess fireworks in public if you're under 18 and it’s against the law to throw or set off fireworks in the street. David Williams added, “Bonfire night is a time families enjoy. But unfortunately accidents can and do happen. Even if you think you know how to handle fireworks look again at the Fireworks Code to ensure you and your loved ones have a safe and happy time on bonfire night. • Only buy fireworks marked BS 7114. • Don’t drink alcohol if setting off fireworks. • Keep fireworks in a closed box. • Follow the instructions on each firework. • Light at arm's length, using a taper. • Never go near a firework that has been lit. Even if it hasn’t gone off, it could still explode. • Never put fireworks in your pocket or throw them. • Always supervise children around fireworks. • Light sparklers one at a time and wear gloves. • Never give sparklers to a child under five. David Williams, Labour’s Parliamentary Candidate for Crewe and Nantwich, welcomed the announcement from the Government this week to introduce measures to ensure that people get a fairer deal from Credit Card and Store Card companies. This announcement builds on a series of financial reforms that are designed to make sure that customers are better informed, financial institutions are better managed and markets are better regulated. Alderman Peter Kent, former Leader of Crewe & Nantwich Borough Council, is supporting David Williams as the next MP of Crewe & Nantwich as David Williams is Standing Up for Crewe & Nantwich. CREWE residents are being urged to take part in the West End's Big Tidy Up. The project is supported by Labour's Parliamentary candidate for Crewe and Nantwich David Williams and Crewe West Councillor Roy Cartlidge. The initiative forms a part of the Community Action Week programme. Agencies across the West End of Crewe are banding together to clean up grot spots and consult with residents on the improvements they would like to see. Cllr Cartlidge said: “The main problems at the moment are litter and fly-tipping. "As soon as we have cleared an area of rubbish, it seems to be as bad as ever again in a matter of days. David Williams added: “We all have a personal responsibility to keep our shared spaces clean and tidy. "As well as involving residents in the Big Tidy Up, we need to see the council making a real difference. There will be open air consultations at the open space behind Minshull New Road and Hulme Street on Tuesday October 27 from 10am until 12noon and from 4pm until 6pm. On Friday October 30 from 11am until 2pm the consultation will be in Frank Webb Avenue play area and Frank Bott Avenue field as part of the free half-term Family Fun Day. The Tory MP for Crewe & Nantwich is accused of hypocrisy by attempting to take credit for the creation of new jobs. David Williams, the Labour Party’s Parliamentary Candidate for Crewe and Nantwich, has accused Edward Timpson of being two-faced by attending the announcement of the first 20 of 200 new jobs funded by a £1.3 million cash injection from the Labour Government. 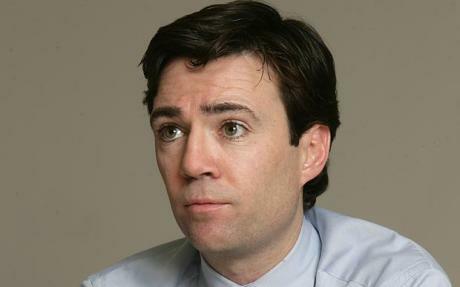 David said, “I cannot believe a Tory MP is trying to claim credit for new jobs created under Labour’s Future Jobs Fund”. The Tories opposed Labour’s fiscal stimulus aimed at bringing the country out of recession. The ‘Future Jobs Fund’ is a big part of Labour’s action on the economy. It will create 150,000 new jobs with training for young people nationwide, with an initial 200 in Cheshire East. David Williams continued, “This dispute is crucial to the future of the Crewe Sorting Office. Last year I gave my full support to the CWU when I spoke on the steps of the Municipal Buildings at their rally. I then called for management to negotiate with the Union on a national plan and to stop picking-off sorting centres for closure like Crewe. “It saddens me that twelve months later I have to repeat that call. Management must be transparent on the modernisation proposals to enable an agreed way forward with the Union, it is the only hope for Crewe. 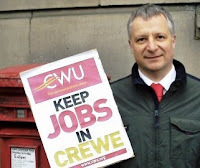 David Williams concluded, “I can assure Crewe and Nantwich postal workers that they have my full support and that of the local Labour Party. Our joint efforts saw off the threat of privatisation and we must now get an agreement on the future of Royal Mail. 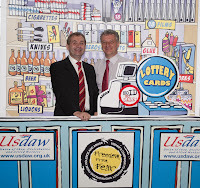 Speaking at an Usdaw campaign event in the House of Commons, David Williams continued, “Shopworkers have to make on-the-spot judgements about customer ages all the time. “Refusing to serve can be a flashpoint for abuse, both physical and verbal, and even asking for ID can be enough to make some people kick-off. “On the other hand, if a shopworker serves an underage customer, they are liable to an £80 fixed penalty notice, with repeated breaches resulting in a court appearance or a fine of up to £1,000. “The balance is not right, there is too much responsibility on the shopworker and not enough on the underage person who is attempting to buy. John Hannett, Usdaw General Secretary added, “We have a lot of support from MPs and future MPs like David on this important issue. Many of our members find age-related sales one of the most difficult aspects of their job. Pictured: David Williams and John Hannett. The conference season has shown that the next election will be a big choice about the change we want for Britain. Labour offers change for the mainstream middle. The Conservatives offer change to benefit the privileged few – a change you can’t afford. - Guarantee a job or training place to 18-24 year olds out of work for a year. - Guarantee diagnosis within one week if your GP suspects you have cancer. 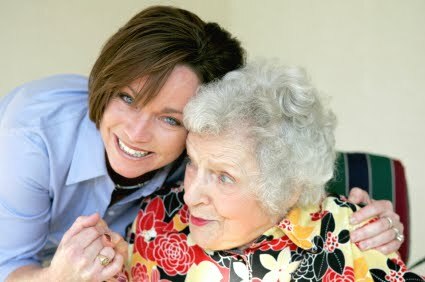 - Free personal care at home for those with high needs. - No-nonsense intervention to tackle 50,000 problem families. - Cut the deficit in half in four years. - Give a £200,000 tax cut to the 3,000 wealthiest estates. - Cut £1,000 in child trust fund payments from families earning modest incomes. - Scrap guarantees for cancer patients. - Abandon young people to the dole. - Cut the equivalent of 3,500 police from our streets this year. Published and promoted by Ken James on behalf of David Williams both at 4 Chantry Court, Forge Street, Crewe, CW1 2DL. e-mail agent@davidwilliams.org.uk Hosted by Google Inc. 1600 Amphitheatre ParkwayMountain View, CA 94043.